Chainpure village situated in eastern nepal is not just famous for its khukuri/kukri but for artistic brass and wood work also. This kukri has carved Indian rosewood scabbard adding more beauty to the kukri. The carving is all done by hand using domestic tools. Aluminum handle for better looking and longer lasting is also carved the same way. 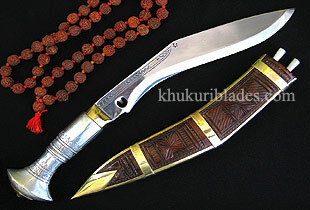 This kukri is not just for show but can perform like any other ordinary kukri for cutting and chopping. Best seller now.